2019 CADS National Festival | It is a week of adaptive ski & snowboard improvement lessons for all levels, race training, camaraderie, fun games, on snow activities, and a wind up Awards banquet on Thursday. The CADS Instructors that are working with the students are the best in the county, all certified at a CADS Level 2, 3, or 4 with years of experience. Children of God | Urban Ink's "Children of God" is a gorgeous, powerful musical about an Oji-Cree family whose children were taken away to a residential school in Northern Ontario. The story of Rita, a mother who was never let past the school’s gate, and her kids, Tom and Julia, who never knew she came, pushes toward redemption. Children of God offers a thrilling blend of ancient traditions and contemporary realities, celebrating resilience and the power of the Indigenous cultural spirit. Inspired by First Nations music, Payette’s profoundly moving score also includes echoes of provocative Broadway masterpieces such as Fun Home and Next to Normal. Full Moon and Spring Equinox Salt Sauna Meditation | The full moon and Spring Equinox land on the same day this year; a special event that hasn’t happened in 19 years! Not only that, this is the last super moon of 2019, making it the perfect time to join Zen’s Coralee Salomons for sound healing, reiki and meditation in the infrared salt sauna. This event takes place on March 20 from 7-8pm and the fee is $25 +gst. Limited to six participants. Trails BC/Chief Isadore Trail Travelogue- Isle of Skye- Scotland | PRESENTED BY JANICE STRONG AND JAMIE LEVINE- Join us to experience this memorable trip- it's more than just a walking tour- with one of our region’s most acclaimed outdoor photographers. ADMISSION BY DONATION: Hosted by Trails BC- as the volunteer stewards of the Chief Isadore Trail and the proponents of the Cranbrook Great Trail Loop. This event is a fundraiser to help us support the maintenance and the development of region's expanding trail network. 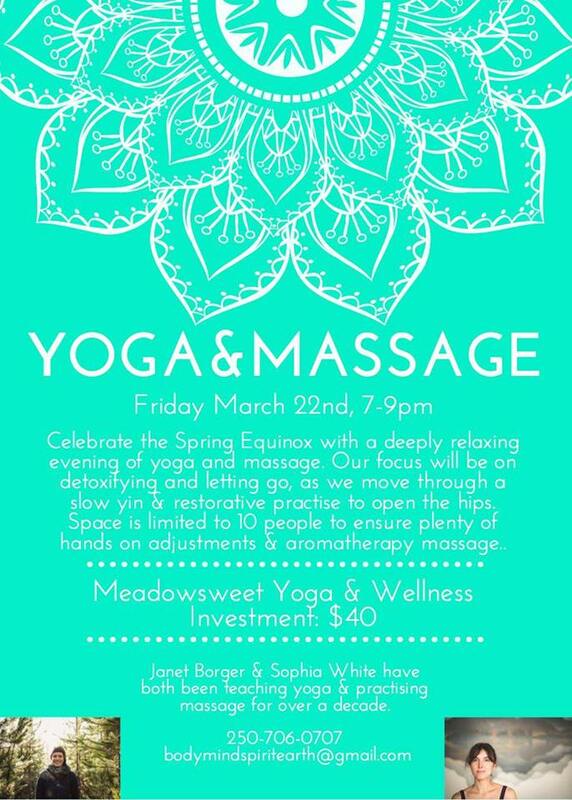 Yoga & Massage with Sophia & Janet | Celebrate the Spring Equinox with a deeply relaxing evening of yoga and massage. Our focus will be on detoxifying and letting go, as we move through a slow yin & restorative practise to open the hips and stimulate the liver & gallbladder meridians. * Hosted by Meadowsweet Yoga & Wellness, Sophia White Yoga, Nutrition & Hypnotherapy, and Janet Borger Massage & Yoga. Lizzy Hoyt - Celtic Quartet | Acclaimed songwriter, Lizzy Hoyt is one of Canada’s most powerful Celtic-folk artists. Known for bringing history to life with music, she is a Queen’s Diamond Jubilee Medal recipient for her work commemorating Canadian veterans and Vimy Ridge history through music. 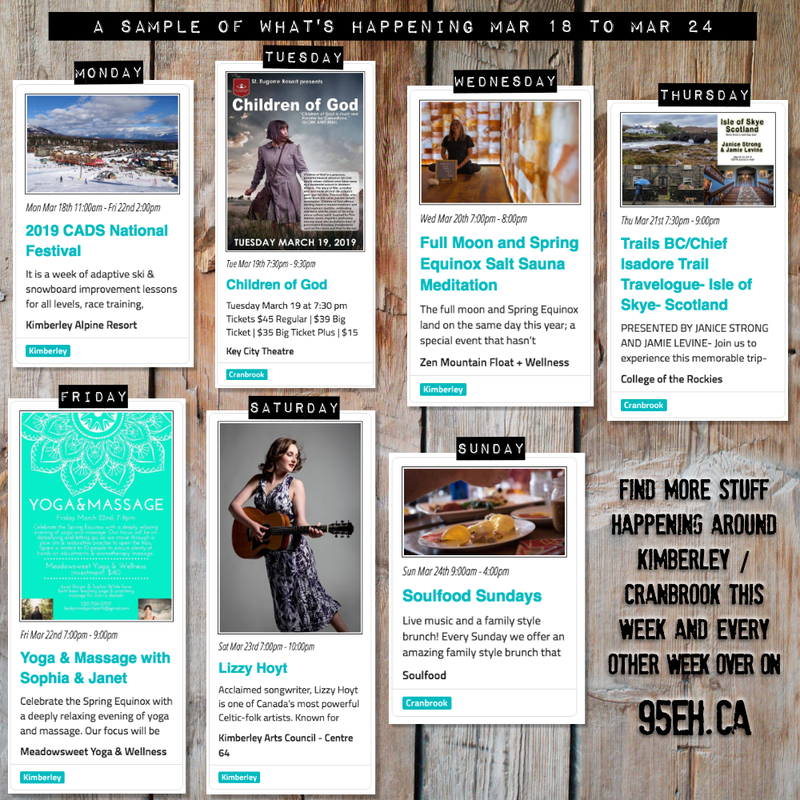 A talented multi- instrumentalist (fiddle, guitar, harp and mandolin), she has been nominated for Canadian Folk Music Awards, Western Canadian Music Awards, Independent Music Awards and more. Lizzy is a full-time musician who has travels and tours throughout the year with her trio. Live@Studio64 - Spring Concert Series Concert #1: Lizzy Hoyt - Celtic Quartet | March 23 | 8 pm | Studio 64 | $24-$28, series pass $66-$72 | Members pay less! Soulfood Sundays | Live music and a family style brunch! Every Sunday we offer an amazing family style brunch that includes your choice of eggs (bennies too! ), sourdough waffles, Cutter Ranch honey ham, roasted kale and hashbrowns. Don't feel like sharing? No worries, the Little Soul menu is available too!